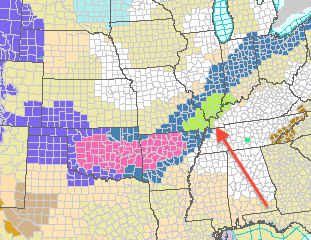 The light green is a newly-issued blizzard watch. The snow will begin Christmas evening with 6 to 12 inches expected along with drifting snow. Travel will be very hazardous and definitely not recommended. Pink is a winter storm warning. I'm concerned that 5 to 10" will fall along I-35 between Oklahoma City and the Kansas border. Winter storm watches are out farther northeast into northern Ohio. Mike...The NWS Springfield, MO will be placing SW MO under a Winter Weather Advisory beginning Christmas Day at Noon. We can expect one and up to three inches of the white stuff. Actually, I thing SGF may get a little more than that.